VIZ Media, LLC (VIZ Media), a premier company in the fields of publishing, animation distribution, and global entertainment licensing, delivers the highly-anticipated home video release of BORUTO: NARUTO THE MOVIE on March 28th, and will be followed by the Volume 1 launch of the BORUTO manga series on April 4th. BORUTO: NARUTO THE MOVIE will be released as a Blu-ray/DVD Combo Pack as well as a Standard Edition DVD. This exciting anime feature film adventure is based on the smash hit NARUTO manga series created by Masashi Kishimoto and depicts the rebellious son of the legendary ninja who seeks to become an even greater ninja. 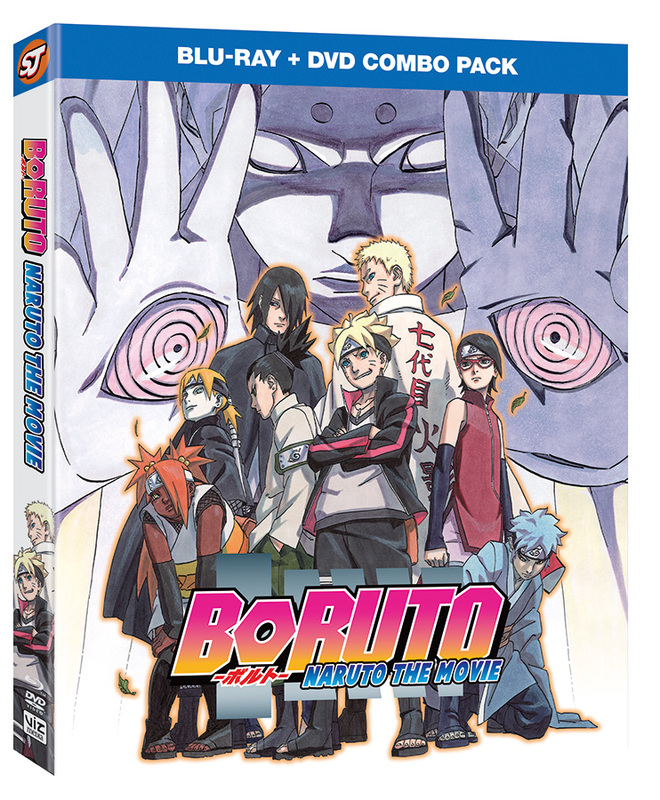 The BORUTO: NARUTO THE MOVIE Blu-ray/DVD Combo Pack will carry an MSRP of $29.98 U.S. / $34.99 CAN; the Standard Edition DVD-only Set will have an MSRP of $19.98 U.S. / $24.99 CAN. The film is highlighted by a stellar English dub cast featuring Amanda Miller (Boruto), Cherami Leigh (Sarada) and Robbie Daymond (Mitsuki). English subtitled with Japanese audio as well as English dubbed selections are available on both formats. Bonus features include clean closing segments and the original Japanese theatrical trailers. The Blu-ray/DVD Combo Pack will be released as a deluxe, 2-disc collection (1 DVD & 1 Blu-ray) that presents the anime feature film in crisp 1080p HD, 16×9 video. Notable bonus combo pack exclusive features include a NARUTO OVA (The Day Naruto Became Hokage) and a production art gallery. The Standard DVD Set will present the film in 16×9 video with DTS-HD 5.1 as well as stereo audio. Sasuke, who’s been on a mission, appears before Naruto to warn of a strange impending danger he has sensed. Shrouded with an evil aura, Momoshiki and Kinshiki appear during the Exams and attempt to weaken and kidnap Naruto. Boruto is petrified and unable to do a thing while Sasuke guards him. As Naruto steps in front to shield them, he smiles faintly and disappears in front of Boruto. 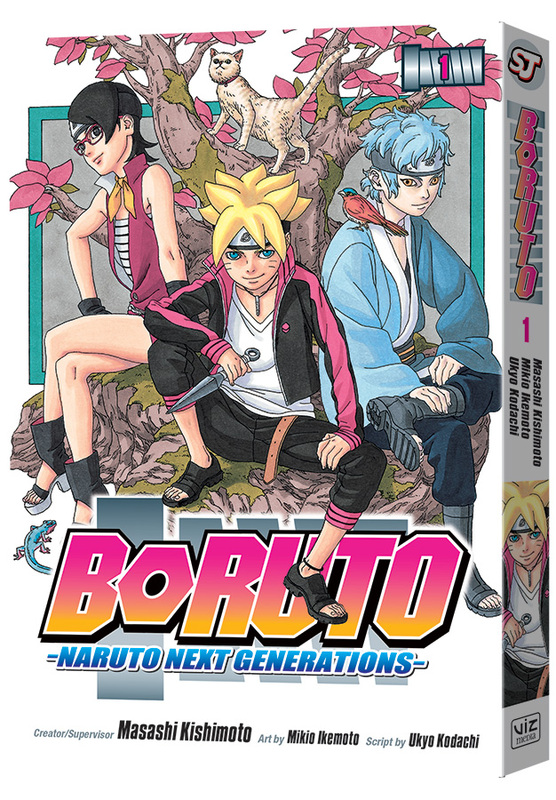 VIZ Media follows the release of BORUTO: NARUTO THE MOVIE with the debut of the BORUTO: NARUTO NEXT GENERATIONS manga series on April 4th. Currently released monthly in WEEKLY SHONEN JUMP, the world leading digital manga magazine, this new series presents the sequel to the internationally bestselling ninja adventure manga created by Masashi Kishimoto. This series is rated ‘T’ for Teens and will be published in print as well as digital editions. Volume 1 will carry a print MSRP of $9.99 U.S. / $12.99 CAN. BORUTO: NARUTO NEXT GENERATIONS will also be available digitally via VIZ.com/read and the VIZ Manga App, as well as from the Nook, Kobo, Kindle, iBooks, comiXology, and Google Play stores. Subsequent volumes of this ongoing series will be published in English on a triannual basis. In the manga series, Naruto was a young shinobi with an incorrigible knack for mischief. He achieved his dream to become the greatest ninja in his village, and now his face sits atop the Hokage monument. But this is not his story… A new generation of ninja is ready to take the stage, led by Naruto’s own son, Boruto! For additional information on BORUTO anime and manga titles distributed and published by VIZ Media, please visit VIZ.com.